When you discover a wonderful new place exists of which you had no previous knowledge, but then you find out it’s only been there for a couple of months…Well, that at least makes you feel a whole lot better and drastically reduces the FOMO. Open since last December, this is the case with Old Road Wine Co, which is on the R45 just before you get into Franschhoek village, on your right, and it’s well worth seeking out. The winery produces an astonishing 15 wines, some from ancient vines and single vineyards – being the top of the range – all the way through to The Originals entry level. I have to say, I feel an affinity with The Quirky Ones; not just because of their names, but I rather fancied the contents of the bottles too. Juliette is a frisky Sauvignon Blanc that will grow up nicely in the next couple of years, and a few bottles of The Spotted Hound red blend found their way into my car and back to Cape Town. Winemaker Ryan Puttick guided us through a tasting of nine of the wines, each with their accompanying story and the raison d’etre of their names. For example, the Pardonnez Moi Cinsaut, which bears a drawing of Marie Antoinette with her head in the guillotine, comes from the moment when she was walking to her death sentence and accidentally stood on the foot of her executioner. Her famous last words were: “Pardonnez moi, monsieur. Je ne l’ai pas fait exprès.” (“I did not do it on purpose.”) For all her faults, the woman still had good manners right up until the end. The label just won bronze in the fifth annual Wine Label Design Awards, which took place two weeks ago. The tasting room as well as The Fat Man Restaurant, The Farmyard, the Anemos Deck and Old Wine Co Restaurant run parallel along the road and as such have the beautiful view of vineyards and mountains on the other side. The Franschhoek Wine Tram track skirts the edge of the property so I predict this will eventually become a stop on the popular hop-on hop-off route. After the interesting and informative tasting, we moved over to the deck for lunch. The Fat Man has a massive pizza oven, the exterior of which is adorned with two-cent coins. How many? No one can say, but I’m willing to bet you can send the children off to count them, and keep them out of your hair. With so many lovely shady trees, and the view of course, outside seating is always going to be popular. However, the interior of the restaurant is home to a stunning mural, which covers an entire double volume wall. The décor throughout is carefully considered to include the current trend of bare brick with rustic copper and rose gold accents. The pizza oven dictates specialities of flatbreads and pizzas. Toppings include air-dried pork loin, rocket and red wine reduction; glazed chicken or pork with toasted sesame seeds, coriander and miso pesto; and smoked provolone, fennel spiced sausafe, olive oil and spring onions, among others. For the lighter appetite, or something to enjoy with a bottle of wine, have some beer nuts or wine nuts, a cheese and charcuterie platter, bacon popped popcorn, pork crisps, or marinated olives. 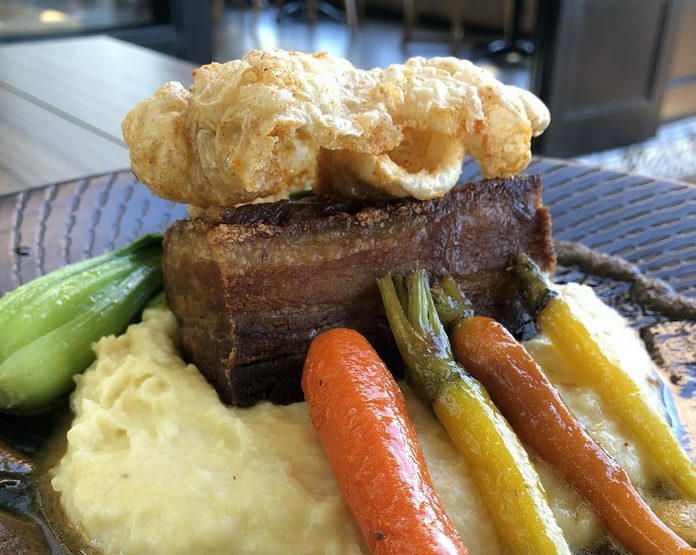 We ordered from the signature dishes: sesame seared tuna served with lightly pickled ginger and radish, and a master stock glaze; and smoked pork belly with pommes puree, pak choi and sweetened carrots, with sweet chilli glaze and hard cider jus – plus a cloud of crackling to crown it all. Mine was a 250g ribeye – can we take a moment here – wrapped in pancetta. It was served with a delicious garlicky chimichurri, carrots and potato wedges. Once upon a time, calling someone a “meat, potatoes and two veg” person was something of an insult, implying boring and dull. That was clearly before chef Reimond van der Walt came up with this dish. I wish I’d had space for dessert. Choices include smoked dark chocolate panna cotta, matcha green tea and stone fruit parfait; and crème brulee with Tant Sannie se Melktert (it’s a creamy liqueur from the gods) flavoured sponge, a brandy snap and berry syrup. Oh heck. Looks like I’m going back to Franschhoek. * Old Road Wine Co. is on Huguenot Road (R45) in Franschhoek. Opening hours are Tuesdays to Sundays, 10am until 10pm. Kitchen open from 11am until 9pm. For more information, call 021 271 0379; or send an email to: info@orwc.co.za.